A little over ten years ago, a fellow by the name of Harvey Goldmintz came to town and opened a company called Blue Mountain Rentals. Almost overnight the company became quite successful and had more rentals listed on its website than anyone else. But then why would it not? Under the Real Estate and Business Brokers' Act anyone engaged in the sale, transfer or lease of real estate must be licensed. We must prodigiously abide by all the rules, both ethical and procedural, set out by the Real Estate Council of Ontario in order that the consumer is sufficiently protected from unscrupulous real estate agents. We must also maintain two separate trust accounts which are open for audit by RECO at any time. Mr Goldmintz was free from any of these costly and time consuming restraints. In 2005 a complaint was lodged with RECO and they agreed to proceed with civil litigation against Mr Goldmintz. In 2008 a judge ruled in favour of Mr Goldmintz and found him not guilty on both counts. The decision was appealed and today, the Supreme Court of Ontario overturned the previous decision and found Mr Goldmintz guilty of illegally trading in real estate without a license with a sentence to be handed down in the near future. This is a good day for the consumer and a good day for real estate! Urinals..the origin of social networking? I have always been intrigued and fascinated by the the graffiti in public washrooms. What motivates a person, while standing at a urinal or sitting in a stall, to take a pen or a sharp object and scribble a message on the wall? Then recently, I saw a display on the internet from an artist who photographed grafitti in washrooms. One particular photo of a stall had an extensive discussion going on about abortion. It had, what looked like, hundreds of participants with circles and arrows connecting their message and point of view to previous messages. When I was in Turkey last year, I sat in a public urinal in a colesseum that was built in 300 BC. Evidently, Alexander the Great used it! Anyway, there was grafitti etched in the stone. It is vary apparent, therefore, that humans have had a strong desire to participate actively in current events and public opinion since before the millenium. What was lacking, in most cases. was the proper medium. Can it be any wonder then why the recent phenomemon of social networking sites such as Facebook, Twitter, LinkDen, etc have experienced such global acceptance and success? It is also why grafitti (of all kinds), which peaked in the early 90's has been slowly diminishing. About the same time as Facebook and Twitter came on the scene. Collingwood, like most communties in the world, would like to do their part to perserve our environment. However, the struggle to develop renewable resources in a densely devolped world has been difficult. Everybody wants it but not in my back yard or if it diminishes my quality of life. Solar, wind, biofuels, etc are all great but where do you put them? Case in point. Collingwood, through great effort, attracted an ethanol producer to take over our old starch plant. The old starch plant was in operation for many years and in our only industrially zoned section of town. Recently, however, a residential development was built close to it. All the buyers in this development were made aware that, periodically, odours would emit from the plants across the street. However, Collingwood Ethanol emitted more noise and odour than was acceptable and the struggle began. Today, Collinwood Ethanol, newly named Amaizeingly Green, pleaded guilty to charges by the Ministry of the Environment for violating the Evironmental Protection Act and was fined $300,000. CE also pleaded guilty to an additional charge of operating odour-causing equipment without obtainibg necessary operating approvals from the MoE and was fined $25,000 accordingly. With all that has gone on in the past year, I believe that the Ethanol plant will probably not survive. Personally, I don't think ethanol is a viable and economically feasable alternative fuel and don't really care if they shut down. What I am concerned about is the general difficulty of creating alternative energy. We also have wind enrgy operations trying to set up in our region and they are running into the same kind of opposition. It's all fine but not in my back yard! What is the solution? Where is the compromise? It was with great interest that I read a recent article in the Toronto Star about a keynote address that stunned builders. American auther, public speaker and social critic James Howard Kunstler, outlined his vision for the not-so-distant future last weekend at the Canadian Home Builders' Association annual conference. In it, he said; "The future will include a return to locally grown food, a resurgence of small cities and towns and an end to the days of "Happy Motoring" and the car-dependent society as world oil production declines." I have believed this to be true for a long time and, in fact, back in 1990, my wife and I decided to "walk our talk". It was a difficult decision, at first, to move from the pristine new subdivision in Unionville with large homes, manicured lawns with pools in the backyard and friendly neighbours always ready to share a cocktail and some idle chatter. However, after numerous glasses of wine one evening, we tossed a coin and in a few weeks were making plans to move permanently to our cabin in Collingwood. It was all about moving to a place we cared about and enjoying a lifestyle that was not surrounded by suburbs, strip malls and mega parking lots populated with big box stores. During the years that we have lived here, we have seen with increased evidence, what Mr Kunstler is talking about. I look at the popularity and success of such enterprises as our "100 Mile Market" which only sells meat and produce that can be obtained within a 100 miles of the store. I look at a butcher in Collingwood known as Blue Ridge Meats which is located directly across from Loblaws that is thriving. I see people picking up their canned or packaged goods from the large commercial outlet and walking across the street to get their locally grown, often organic meat even though it may cost a few percent more. I look at how the community gets involved with local politics, arts and education and health care. Another wonderful example of how people care about their community was recently evident in Haliburton. John Tory, the leader of the Conservative Party and in my opinion, one of the "nice guys" in politics, tried to get a seat in parliament by running in the safe conservative community of Halibuton. This was perceived to be such a shoe-in that the Liberals did not even bother to spend any time or resources in the area. The local Liberal candidate was a fellow by the name of Rick Johnson. I happen to know Rick. He and his talented and beautiful wife, Terri Crawford, are accomplished musicians and Toni Award nominees. They played at my son's wedding and have provided the live entertainment at our friend's private Elvis Weekend party for the past 10 years or so. 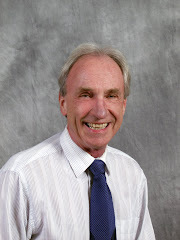 Rick has been heavily involved in local politics and more specifically, as a trustee on the Board of Education. He and and his wife have also published numerous childrens' songs and educational materials. In summary, Rick and Terri were and are still, well loved and respected local members of the community and even if it meant voting against local political beliefs or terminating the carreer of a talented political leader such as John Tory, the voters' love and care for community came first. I don't believe this scenario could be replayed in a large, sprawling suburban community. I hope Mr. Kunstler is right and the large, mass production builders are listening. The importance of small communities or as the province likes to call them, "settlement areas" is critical in terms of the sustainability of a healthy lifestyle for future generations and the weaning off of oil dependency. One of the topics I spend more time talking about to media, clients and colleagues is the Average Sale Price trend of properties in our region. (Collingwood, Wasaga Beach, Blue Mountains and Clearview)While I understand the relevance and curiosity in obtaining these statistics, I am often disturbed as to how they are interpreted and used. 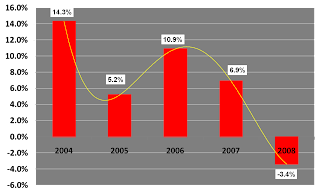 The accompanying graph illustrates the change in the average price of residential units sold on the Georgian Triangle Real Estate Board since 2004. However, it does not necessarily mean that your property (if you have made no changes to it)is worth 3% less than last year or 20% more than in 2004. What needs to be looked at is the composition of the sold inventory. One of the greatest influences of the average price statistics are the homes that are currently being sold that did not exist 10 years ago. Many of these new subdivisions, especially at the bottom of the Niagara Escarpment, have homes/chalets that start at $1,000,000. However, there has been a definite increase in property values as illustrated in this graph. Here, we show the number of properties sold in different price catagories. 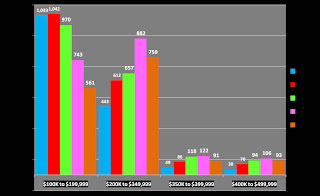 The bars on the far left show the number of homes sold in the $100K to $199K range in each year from 2004 to 2008. You can see a distinct decline each year. In contrast, the next catagory from $200K to $349K shows a steep rise. These homes are most likely not new homes but the supply and demand of affordable homes in the area have pushed the prices of these units to new levels. In contrast, I have personally sold a well kept home on an attractive street close to Blue Mountain Resort for the same price over a period of little over 2 years. Neither buyer or seller was under any pressure and there was no alterations done to the building. I believe this to be a true indicator of our market. Generally speaking, I believe that we peaked in terms of average price increases in July of 2004 and have more or less flatlined since then. (this may not apply to homes under $300K in the town of Collingwood) I conclude, therefore, that a certain caveat should be excercised when quoting or making use of "average" price increases or decreases. Broker of Record/Owner of Royal LePage All Real Estate Services Ltd. servicing the Collingwood and Blue Mountain area on the South shore of Georgian Bay.